The sympathetic nervous system (SNS) is a part of the autonomic nervous system, an extensive network of neurons that regulate the body’s involuntary processes. The autonomic nervous system mediates actions that occur without voluntary control such as heart rate or blood pressure. It consists of both the sympathetic and parasympathetic nervous systems, and they often act in a complementary manner. The functions of the SNS are varied, and can depend on whether it is activated in a localized manner or across the body. The SNS can maintain homeostasis through actions like sweating to dissipate heat, or by altering cardiac output based on position and activity level. However, it is best known for its stimulation of the body’s fight-or-flight response. Specifically, when the entire SNS is activated, there is a cascade of reactions from all the organ systems of the body, which prepare the individual to deal with an emergency. This includes an increase in heart rate, bronchial dilation, increase in cardiac output, and dilation of pupils, all of which are directed towards heightened awareness and preparation to combat danger. Blood circulation is preferentially targeted towards skeletal muscle, with a reduction in blood flow towards non-essential organs. Therefore, there is vasoconstriction in the gastrointestinal tract and skin, and compensatory piloerection to allow the body to remain warm. While it could be a short-lived physical danger that you have to either fight or escape from, the SNS could also be activated in response to long-term psychological or emotional stress. The SNS consists of two sets of neurons – those that have their cell bodies within the spinal cord, and those whose soma resides in ganglia outside the central nervous system. The first set, called presynaptic neurons, has its cell bodies within the thoracic and lumbar sections of the spinal cord, and release a neurotransmitter called acetylcholine at synapses within ganglia. Acetylcholine is taken up by receptors on postsynaptic neurons. The activation of postsynaptic neurons leads to the transmission of an electrochemical impulse along the length of their axons, till there is a release of noradrenalin at the synapses with peripheral tissues. Among the many targets for presynaptic neurons, is the adrenal medulla. Prolonged systemic activation of the SNS leads to the release of adrenaline and noradrenaline from the adrenal medulla. While the SNS is commonly referenced with respect to its whole-body response, it has a number of roles to maintain homeostasis. It regulates body temperature, both by mobilizing fat reserves to enhance heat production and by changing blood flow to the skin. The SNS can also stimulate sweat glands to cool the body down. It can initiate a long-term response to prolonged cold periods by controlling some cells of adipose tissues and stimulating the release of fatty acids from them. At the same time, heat is lost from peripheral extremities through sweat, even when the body is at rest. Additionally, the sympathetic nervous system regulates minute changes to the cardiovascular system. When there is a change in posture, from sitting to standing, for example, cardiac output needs to change to accommodate this alteration. In people suffering from disorders of the SNS, one of the first signs of an ailment is postural dizziness. Similarly, during intense exercise, the body needs to focus on delivering nutrients and oxygen to skeletal muscle and quickly removing the metabolic waste generated in the tissue. 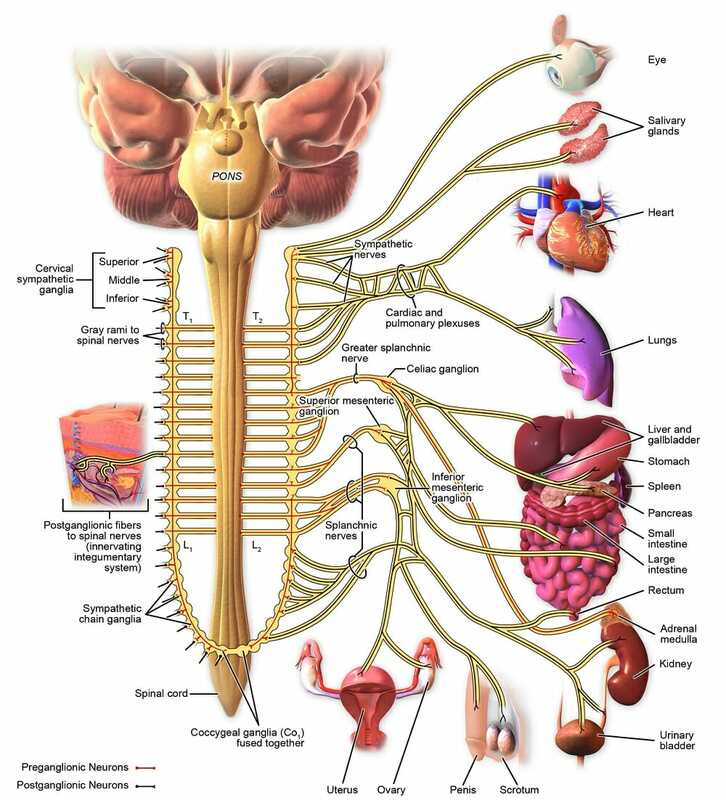 This is also mediated by the sympathetic nervous system. It can even modulate circadian rhythms and there is usually a surge of SNS activity during the transition from sleep towards awakening. When the body faces a perceived threat, the entire SNS comes into play. Skeletal muscles contract, and begin to convert glycogen into glucose. There is an increase in heart rate as well as heart output, and bronchial tubes dilate to facilitate better gas exchange. Pupils dilate to enhance visual input, even in low light. All these changes are geared towards intense physical activity. At the same time, salivary and gastric secretions decrease, peristaltic movement reduces, gastric and intestinal sphincters are constricted. Urinary output also declines, as the body increases its need for water. SNS activity also controls blood loss through vasoconstriction. Upon extended SNS activation, a number of negative side effects appear, such as poor appetite and digestion, difficulty in urinating, low sexual desire, permanently elevated blood pressure and heightened cardiac stress. Among the key endocrine targets for the SNS is the adrenal medulla, which is stimulated to secrete epinephrine and norepinephrine, to enhance the effect of the neuronal activity of the SNS. In fact, presynaptic neurons directly synapse with cells in the adrenal gland, making it functionally similar to postsynaptic neurons of the SNS. In extreme conditions like blocks in the coronary artery leading to heart failure, the sympathetic nervous system can have a counterproductive effect, increasing the force of cardiac muscle contraction, and mediating higher blood pressure through vasoconstriction in peripheral blood vessels. In each of these actions, the parasympathetic nervous system can act as an antagonist, and help the body recover after the threat has disappeared. Comparatively, the SNS has shorter axons than the parasympathetic nervous system and also acts more quickly. The classic case of SNS response is a physical danger, especially with a potential predator, and the preparation of the body for either fight-or-flight. The overall system is designed to enhance voluntary muscle activity while shutting down all non-essential functions. Arterioles and veins in most vascular beds constrict, reducing blood flow to the skin and digestive organs. Sphincters in the digestive organs also constrict, to control the flow of food from one organ to the next. However, coronary blood vessels, pulmonary circulation and parts of the respiratory tree respond with dilation, to enhance cardiac output. The heart beats with greater contractile force and at a higher frequency as well. Vasoconstriction in many parts of the body also increases blood pressure. For instance, when faced with a charging elephant or bull, the body quickly primes itself to run quickly, and for a prolonged period. All the changes to the cardiovascular system are designed to sustain this mode of survival, to focus energy on physical safety. Interestingly, though, the body responds in a similar fashion even when the threat is merely being observed rather than experienced. For instance, when a violent movie scene is being watched, or the highpoint in a thriller novel is being read, the pupils of the eye dilate, the heart pounds, and there is piloerection. While there are individual differences, in the organs that respond to SNS activation, there is nearly always brain simulation of events that aren’t being directly experienced. There are three major molecules that are secreted within the sympathetic nervous system – acetylcholine, epinephrine, and norepinephrine. Acetylcholine plays a major role in synaptic transmission of electrochemical signals from the presynaptic neurons. Norepinephrine is more abundant as a neurotransmitter released by postsynaptic neurons, and binds to specific receptors within effector cells. Examples of effector cells include those that line glands, cells of cardiac or skeletal muscle, etc. The responses that the SNS can mediate are derived from the different types of receptors for these molecules in various cells. For instance, when an α1 adrenergic receptor is activated, it leads to vasoconstriction. However, α2 receptors are more intimately linked with the central nervous system and the regulation of hormones such as insulin and glucagon to provide fuel for muscle activity. Another set of receptors called β1, β2, and β3 receptors are involved in release of fatty acids from adipose tissue and modulating cardiac output and heart rate. Among these, β2 receptor has been extensively studied and has functions ranging from endocrine secretions, to changing the metabolic state of the body and altering the interaction of the central nervous system with the immune system. Ganglion – In neurobiology, refers to a cluster of neural cell bodies consisting of soma and dendrites. Different cells within ganglia are linked to each other through synapses, different ganglia interact to form a plexus. Piloerection – Involuntary bristling of hair on the body, usually in response to cold, or fear. Commonly called goosebumps. Plexus – Branching network of interconnecting nerves or ganglia, that can innervate a relatively large area within the body. Soma – Bulbous cell body of a neuron, containing the nucleus. 1. Which of these statements about the sympathetic nervous system is true? B is correct. The sympathetic nervous system is part of the autonomic nervous system, which is often considered as part of the peripheral nervous system. Even though cell bodies of presynaptic neurons emanate from the spinal cord, they are not technically considered a part of the central nervous system. Presynaptic neurons predominantly secrete acetylcholine at the synaptic clefts within ganglia. Epinephrine or adrenaline is produced by the adrenal gland. However, it is the medulla and not the cortex that secretes this hormone. 2. Why would prolonged activation of the SNS be harmful? D is correct. One of the main functions of the SNS is to reduce digestive and reproductive activities, since the body perceives these functions as non-essential for short-term survival. This often leads to a feeling of lethargy or even anorexia. Not only do gastric secretions go down but, with prolonged stress, even excretory organs are affected. Changes to the body’s metabolism usually generate free radicals that need to be sequestered. Fertility, and the ability to create and maintain a viable fetus, reduces. Extended periods of enhanced cardiac output accompanied by vasoconstriction of peripheral vascular beds results in high blood pressure, and often precipitate the formation of atherosclerotic plaques. Cardiac muscles also suffer wear and tear. 3. Which of these adrenergic receptors has endocrine regulation as its primary function? B is correct. The alpha-2 receptor is seen within many tissues of the nervous system. It plays an important role in the communication between nervous tissue and endocrine glands.